Looming famine in some parts of South Sudan threaten to spark mass exodus of the country’s young population. Authorities in the neighboring Uganda are worried many more people could be on their way already, returning to overburdened Uganda, seeking food. Apart from isolated cases, a group of 50 individuals walking in one single file arrived in Uganda this week, reportedly escaping starvation. The group arrived at Uganda’s Kitgum district police headquarters, the evening of Sunday. For days, the group is receiving food from the police as well as locals. With no clear plan to tackle looming starvation, which is driving people away, South Sudan authorities continue to encourage their nationals who had fled the country’s war to return, claiming normalcy has been achieved. 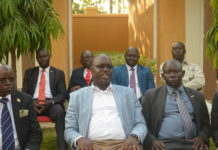 Recently the governor of Torit state, Alberio Tobiolo, was on a more or less campaign trail asking, “South Sudanese nationals in Uganda, Kenya, the Democratic Republic of Congo and Central African Republic” to return home. 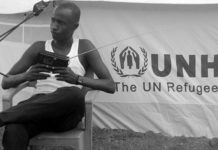 However, both UNHCR and Uganda do not encourage any refugee to go back yet even though some individuals have voluntarily retuned. Returning without security guarantee, small numbers of refugees from various settlements went on journeys aiming to reach Juba and other small South Sudan towns, after a revitalized peace deal was inked in Sudan’s capital, Khartoum. It is believed some do not stay long enough in the war-ravaged South Sudan. They go back to refugee settlements they had left, within the first four months. It is not clear if the newest group include totally new individuals or not. According to Aswa River Region Police Spokesperson, Jimmy Patrick Okema, “the people (new arrivals) are seeking asylum in Uganda”. 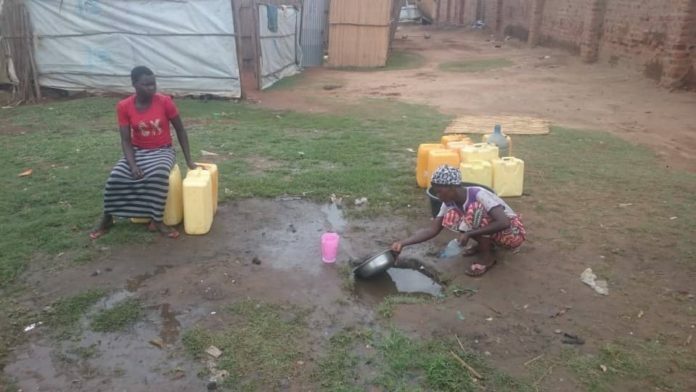 Jimmy says the police are in touch with the Office of the Prime (OPM,) a Uganda government department that deals with the matters of refugees, to transport the “seemingly hungry” women and children to the refugee settlements in the area. Security in-charge of Kitgum district is aware about the new arrivals. He is not surprised at all. “The situation in South Sudan is not stable yet. This particular group came through Kidepo Maji Moto and will be taken to Madi Opei refugees reception center in Lamwo district,” explains Resident District Commissioner, Christopher Omara. The officer thinks if South Sudan leaders do not improve the security situation in the country in order to allow civilians plant their own crops; Ugandans should start bracing themselves for influx of hungry people. He is worried if South Sudan insecurity remains, more people will flee into Uganda. He adds that swelling population will put available resources on immense pressure. “The pressure on our social services like education, health services and water is becoming a huge problem (to serve a swelling population) in our country. I think we should help them while they are in their country (South Sudan,)” he suggests. Meanwhile, the OPM is preparing to receive the 50, according to the Refugees Desk officer of Palabek, Kamuje Julius. The group consists of 44 children and 6 women. They come from South Sudan State of Torit. He wishes South Sudan conflicting parties stopped insecurity. Echoing the words of Christopher, Julius believes ensuring security guarantee for civilians is the only way citizens would get time to rest and “engage in productive work”. Kitgum district borders South Sudan’s Torit. 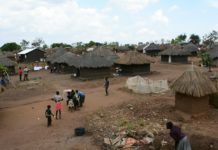 The district is a home to nearly 40,000 South Sudanese refugees, mostly living in Palabek Refugee Settlements. They came during the second half of 2016, after the violent conflict had reached most parts of the Equatorias. Can prayers bring peace to war-ravaged South Sudan? Members of parliament want to amend refugee law of Uganda. South Sudan’s future from a young woman’s perspective. South Sudanese women want Hybrid Court established, amid perplexities over peace or justice, first.